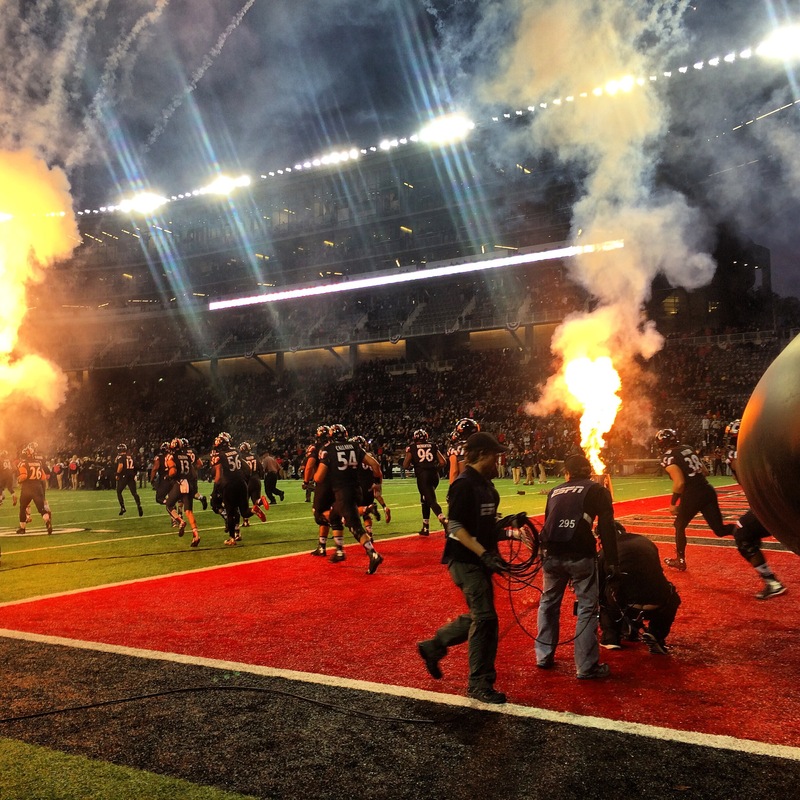 After beating the U 34-23 at home in Nippert Stadium last Thursday night before a record-setting crowd of 40,101 on nationally televised ESPN primetime, plenty of positive energy is oozing out of the Cincinnati players, coaches, and practice facilities this week. 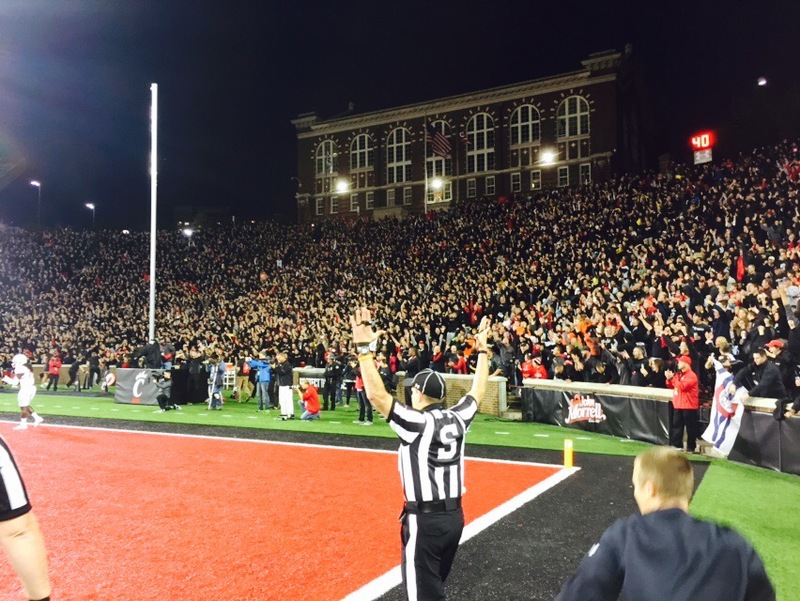 UC now has won 28 consecutive non-conference games at Nippert. The mighty, speedy Miami Hurricanes were undefeated entering the night, and let’s face it – the Canes manhandled UC in Coral Gables a year ago. Gunner Kiel didn’t dress and watched the game from the press box. The Canes were favored by a TD. Nevertheless, UC led was resilient, leading for almost the entire game. The defense grew up and laid some bigtime hits. Brad Kaaya was held without a TD pass. We ran the ball effectively. Hosey Williams’ rumbling, bumbling TD run was the #1 play in the American’s Top Plays of the Week. 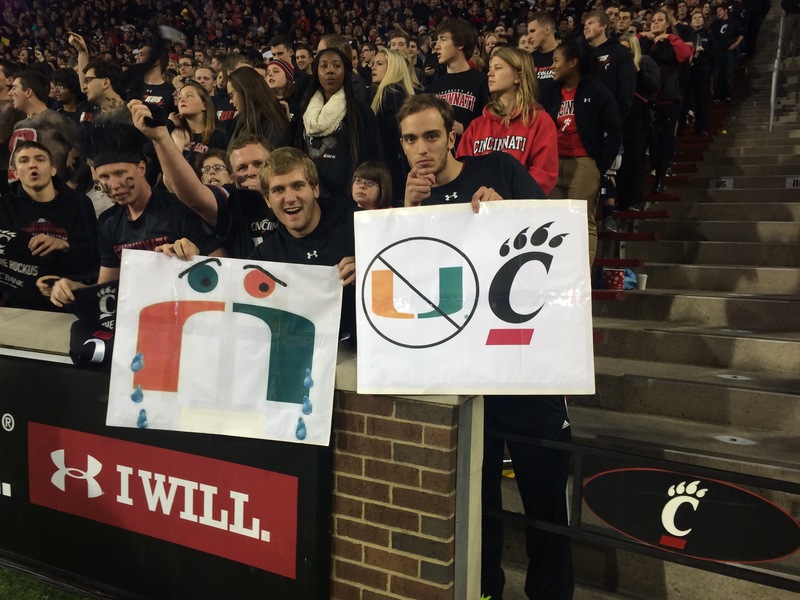 Oh, and UC beat Miami for the first time since the teams played in 1947. Some may criticize the ruckus for rushing the field, but let’s face it – this was a HUGE win. Miami may not have been ranked. But think about this for a second. Just say it out loud to yourself. The Miami Hurricanes played a primetime football game at historic Nippert Stadium and the Cincinnati Bearcats whooped them. That is pretty awesome, and worth celebrating if you have a heart or passion for the game. Going into the Miami game, in the back of my mind I was fearful. I had butterflies in my stomach, somewhat different from the normal fear of the unexpected before any given football game. The issue I recognized, but did not want to acknowledge, was the cold, hard truth – Thursday night was the make or break point of the season, having already lost two very difficult games against conference foes Temple and Memphis. A couple less turnovers or a few more red zone rush yards and UC would have easily won those games. That’s not a naive fan speaking, that’s the frustrating truth. 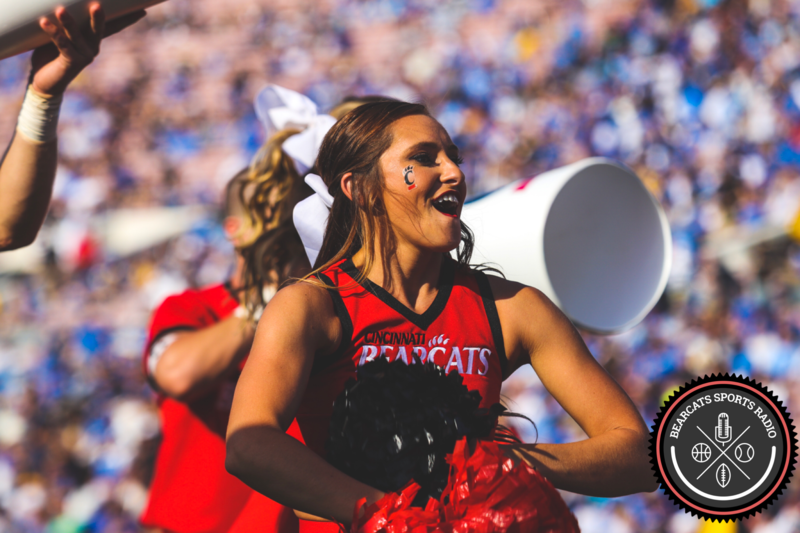 Unfortunately, the ball didn’t bounce our way and the booth review system was completely turned on its head on Beale Street forcing UC to sing the blues. The football team mojo simply cannot handle any more bad luck or poor play. UC had two options entering Thursday night: (1) they could lose, sending the program into a downward spiral resulting in a depressing 6-6 season culminating in a December bowl against a Conference USA or MAC team or some other sad story; or (2) the Bearcats could rally behind redshirt freshman QB Hayden Moore and pull out a W without key offensive and defensive cogs such as Gunner Kiel, Adrian Witty, Chris Moore, Johnny Holton, Mike Boone, and Andre Jones. Thankfully, the latter resulted. From the run out of the tunnel, to getting arranged on the sideline, you could just tell this was a different team. This was a confident UC football team, ignoring the devastating injuries and media gossip outside of the program. 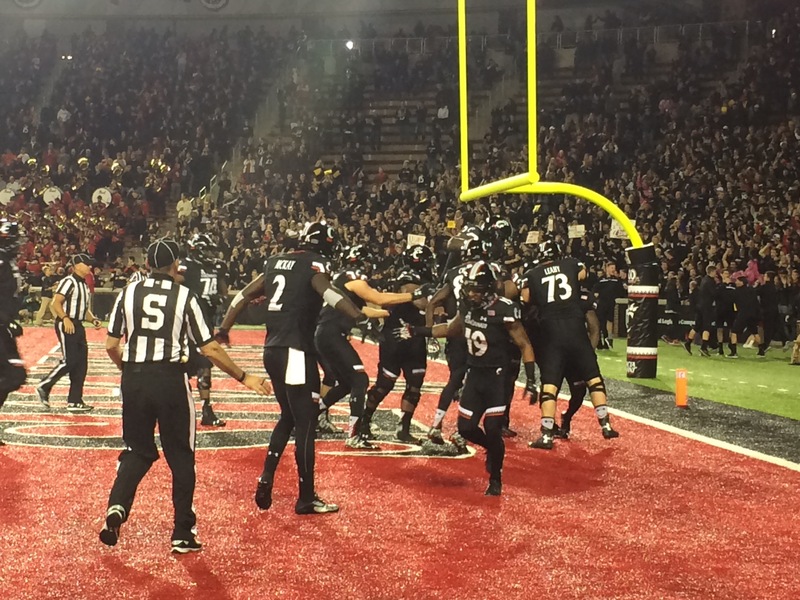 Watching from behind the team benches, it was great to see UC get its swagger back. And it showed during the game. The defense tackled, sacked, and hit with tenacity. The offense pounded the ball and broke tackles. Special teams made all key field goals, punts, and Shaq even had a long punt return into the red zone. I could write about the greatness of Hayden Moore in more detail, but that is obvious and every other media outlet has already done that. The man has great poise and is drastically improving. He is a game manager and does not try to force himself to will the team to victory. Tubs has said Gunner is the best QB and will not lose his starting job due to injury. This makes sense, but Urban Meyer told Braxton Miller the same thing last year, and look at what happened up north. Regardless, it was great to see Gunner come out and celebrate the win with Hayden. The two are great friends and cheering each other on. It will be interesting to see who starts at BYU on Friday, October 16th at 8 pm on ESPN. The Cats get a much needed bye and basically half of October off to rest Kiel, Boone, Moore, Holton, and other nicked up players. Tubs is not having a press conference this week so it will be next Tuesday at least before we know any more about the status of Kiel and injury updates for the team. I am sure the very first question will address who starts. Until then let’s just bask in the season-changing victory over the Miami Hurricanes. UC is also boasting the 4th best total offense in the country. Just imagine if we can cut down those darn turnovers? UC is indeed dead last out of 127 FBS teams in that stat. Side note 1: Maybe we can get back to wearing all black every home game? Who’s with me?! The black uniforms are more than a color. They mean attitude. They are a symbol, a culture even. Someone please get this message through. Side note 2: Shaq Washington needs just 21 catches to become the all-time leading receiver at UC. Side note 3: Recent history in playing the away game of a major home-and-home series as opposed to playing here at Nippert has been brutal for UC. Just look at Oklahoma, Fresno State, NC State, and Virginia Tech. Hopefully, this team can learn from that and have a favorable result against the athletic and hail mary blessed BYU Cougars next Friday night. Side note 4: Yet another band member fell down when running down the stairs on national television, but even this embarrassment could not stop the whooping of Sebastian the Ibis. In case anyone forgot or needs a good chuckle here is the fall from the Pitt game in 2012 when the poor guy lost his mouthpiece and kept playing his trumpet.